StoneWater Zen Sangha is a Zen Buddhist organisation in the lineage of Taizan Maezumi Roshi. It has a traditional, authentic lineage and has been established in Liverpool for over twenty years. The Sangha is growing and there are groups across the UK. The group is led by Dr David Keizan Scott Roshi and is affiliated to the White Plum Asanga. 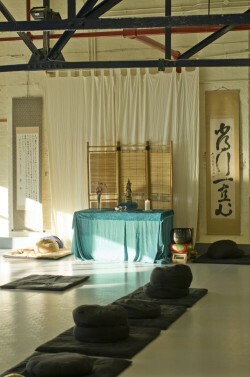 We provide facilities for traditional Zen training throughout the week. Every year we hold two sesshin at Crosby Hall near Liverpool and regular retreats at our zendos in the Lake District and Liverpool. A brief background history of Stonewater Zen sangha and Keizan Roshi can be found here. The sangha is affiliated to The European Buddhist Union and the UK’s Network of Buddhist Organisations. We are a warm and friendly group and beginners are always welcome.